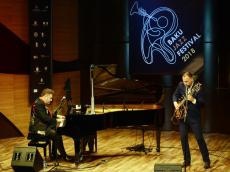 Honored Artist of Azerbaijan Hasan Bagirov (St. Petersburg) and pianist Leonid Ptashka (Israel) performed at the International Mugham Center on October 15. Leonid Ptashka popularized jazz in Israel in the 1990s - early 2000s. He is on the list of the 100 best jazzmen of the 20th century according to the version of the American Biographical Institute, Azertag reported. The jazzman collaborated with such popular musicians as Al Foster, Herb Alpert, Freddie Hubbard, Valery Ponomarev, Igor Butman, etc. Hasan Bagirov is one of the leading jazz guitarists of St. Petersburg and Moscow. His repertoire includes the most diverse music: jazz, bossa nova, fusion. He also teaches at the St. Petersburg Academy of Culture. Leonid Ptashka and Hasan Bagirov made their first performance together. The public met with great interest a tandem of musicians.